Credit card terminals are simply machines that read credit cards. Businesses would not be able to read debit and credit cards without these terminals. While terminals might not be the “sexiest” things in the world, they are vital to business’s and it is important for a business to buy the right terminal, you do not want to go cheap on a product that will end up bringing you a ton of your revenue. One of the first decisions you will need to make when choosing a credit card terminal is which brand of terminal you want to buy. There are three major brands of terminals sold Verifone, Hypercom and Lipman. All brands have their pros and cons and they all do their job so it is tough to recommend one type of credit card terminal over another. If you are going to buy multiple terminals for your business I recommend sticking with the same brand for all of the terminals. There are multiple reasons to use the same brand; the first is that you do not want to make things more complicated than they need to be for your customers and your employees. The second reason is that you will be able to buy the same paper and ink for all of your terminals if they are all uniform which is a good thing. With credit card terminals you get what you pay for. If you pay 100-200 dollars for a terminal you should expect a barebones model that is not going to blow anybody away with any features. Nicer models sell for 200-300+ dollars; this is the price range I like to recommend to small business owners. The terminals are still cheap enough to be reasonable as far as cost goes but you are getting a much higher quality product. You may end up paying more for a nicer model, but it should pay off over time in terms of less repair cost, less upkeep cost overall and a longer shelf life. 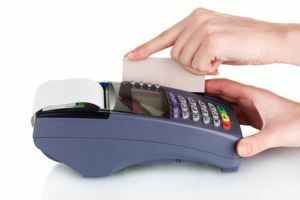 If you buy more than 5 credit card terminals talk to the seller about bulk pricing, a decent profit margin is set into the price of these terminals and the seller is not going to turn away business. Another thing you have to ask yourself before buying a credit card terminal is whether you need the terminal to have a printer or not. Printer less machines are generally much cheaper than machines with printers but most business’s require a receipt of some sort to be printed after a transaction. Verifone Tranz models are the most popular credit card processing machines out there that do not have printing capabilities. Wireless credit card terminals are also available. These terminals are popular with Fedex drivers and whatnot but they are not meant for traditional businesses.